Acupuncture is a highly effective treatment modality for many chronic and acute pain issues, with neck pain being one of them. If you’re suffering from neck pain we are glad you found us on the web today. We have helped countless patients relieve their neck pain and we are highly confident we can help you too. 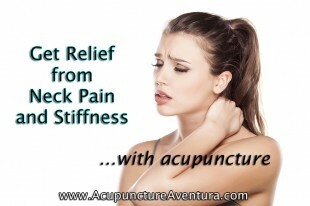 Acupuncture treatment for neck pain has virtually no side effects and is a safe technique. Acupuncture is gentle and painless. Usually patients feel relief within the first few sessions, however your total treatment plan will depend on the severity of your condition. Patients usually receive 1-2 treatments for the first week or two and then gradually decrease the frequency of treatment as they progress. Sessions usually last from 20-30 minutes after the first initial evaluation, which lasts a bit longer. Acupuncture works by reducing inflammation and spasm at the site of injury, while the body releases endorphins, natural painkillers that give you relief while your body heals naturally. Acupuncture is widely acknowledged as being a powerful holistic therapy for managing neck pain. With a reasonable treatment plan, it will facilitate movement and restore proper functioning to your healing body. Neck pain is a common problem and almost everyone at some stage in their life has been subject to stiffness or pain in their neck region. It can be caused by having the head placed in an awkward sleeping position, sudden movement such as whiplash, and medical complications like swelling, inflammation and spasm from disc problems such as bulging or herniated discs. The type of work that a person is involved in can sometimes be a factor. Other factors such as age and medical history may also influence one’s chances of suffering from neck pain. Considering individual needs, acupuncture at our wellness center is applied along with herbal medicines and other remedies to reduce pain, stiffness and spasm while increasing a patient’s sense of well-being. Those who have been treated with this therapy have reported significant improvement. We want to help you get out of pain and improve the quality of your life. You owe it to yourself to try acupuncture. It’s safe, It’s gentle, and most of all it’s effective. Call us today at 786-537-7022 to get started. We do accept insurance!